THE Department of Education faces a legal challenge after failing to relocate Fermanagh’s only Irish language primary school despite a pledge made in 2015, The Detail can reveal. Two-and-a-half years after the green light was given to move Bunscoil an Traonaigh from its temporary accommodation on the outskirts of Lisnaskea – it is still in limbo, with children being taught in mobile buildings described as “falling apart” and P5-P7s being educated in a canteen. 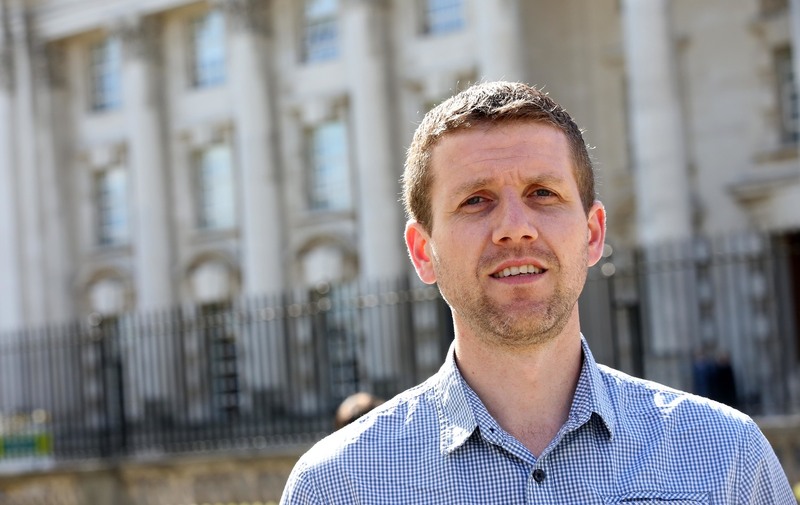 In December 2015 the then Sinn Féin Education Minister John O’Dowd agreed to the school moving on to the site of a former state-run high school, but the scheme faced delays under DUP minister Peter Weir before Stormont collapsed in early 2017. The department now says it cannot fund the move. A parent of one of the pupils has threatened a High Court action against the department. Bunscoil an Traonaigh continues to grow with pupil numbers rising from just 12 when the school opened in 2004 to 60 when the 2018/19 school year gets underway in September. However, when The Detail visited Bunscoil an Traonaigh at the end of June the video below shows the poor condition of the temporary accommodation. The school is made up of three temporary classrooms, one of which is a canteen that is being used to also teach P5-P7 pupils. The school car park doubles as a play area for the pupils. As Bunscoil an Traonaigh’s principal Sorcha Ní Mhurchú told The Detail: “We can’t stay on the site long term because the mobiles we are in are basically falling apart. “One of our classes is being taught in the canteen, it’s not fair on the pupils in there. It’s also a distraction whenever the kitchen area is being prepared due to increased noise. “There just isn’t enough space for children to be able to enter school safely or to be able to play safely. “We are deeply disappointed we are still here. We heard in 2015 we were going to be moving to the new site, Lisnaskea High School. In 2015 the Sinn Féin minister stated in correspondence to the school seen by The Detail that “the current premises occupied by Bunscoil an Traonaigh is not suitable for the permanent location of the school and this new site at the former Lisnaskea High School will allow the school to grow and develop”. Now the department is accused of breaching its duty under Article 89 of the Education (NI) Order 1998 to encourage and facilitate the development of Irish medium education. A similar duty exists for integrated education. The Department of Education said moving Bunscoil an Traonaigh to the former Lisnaskea High site remained its position but “against a constrained capital budget position, funding is not currently available to progress the school’s relocation in the short term”. 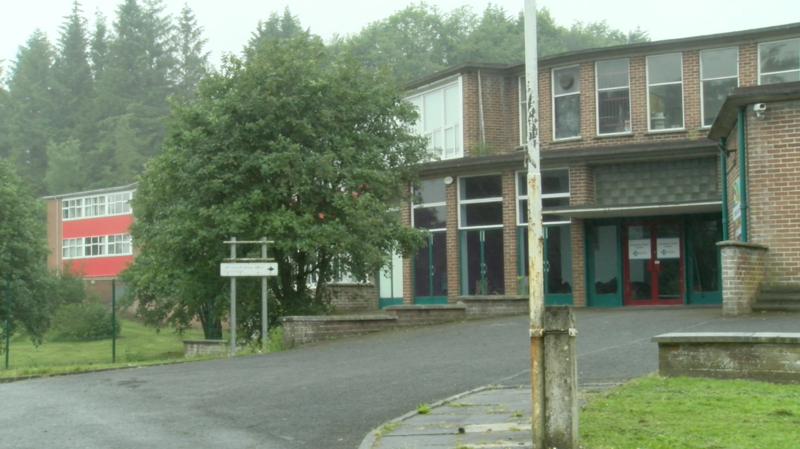 The Detail submitted a Freedom of Information request to the Department of Education regarding the re-use of the Lisnaskea High School site, which would have been attended predominantly by pupils from a Protestant background, but which closed its doors in 2013 with 107 pupils and a significant deficit. The FOI request resulted in the department handing over more than 100 pages of emails, letters, memos and ministerial advice. Our investigation has uncovered detailed documentation dated from December 2015 to September 2017 which shows the Irish medium school’s move had been hampered by a series of delays outside its control. Education Minister John O’Dowd announced his decision to split the Lisnaskea High site between the Irish language school and South East Fermanagh Foundation (SEFF). On its website SEFF describes itself as a group of victims/survivors of terrorism from the community of South East Fermanagh. Extensive government correspondence secured by The Detail shows that after Mr Weir became Education Minister, he examined the issue. Officials make reference to the “minister’s request to pause to look for other options”, while correspondence between officials and Mr Weir’s Special Adviser also reveals efforts to locate other possible sites. An alternative site was proposed at Knocks, which at four miles outside Lisnaskea on a country road was seen by the school as a “significant backward step” to an even more isolated location. The other site had been home to St Eugene’s Catholic maintained primary school which closed in 2013 because its pupil numbers had dropped to 20. That site did not belong to the Education Authority. 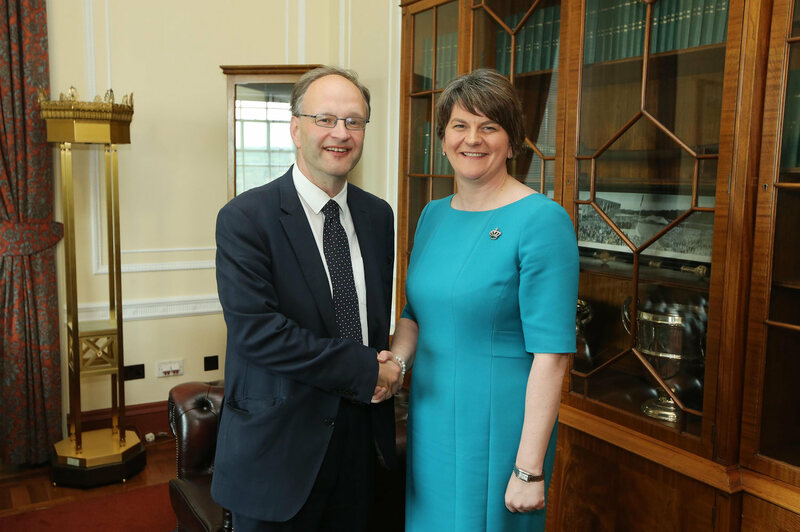 But the correspondence also reveals that SEFF had raised concerns with the minister and other DUP members, including the then First Minister Arlene Foster. SEFF appears from the correspondence to have expected to be granted use of the entire site and was critical of the plan to split the old High School. In a letter in December 13, 2016 to SEFF’s director Kenny Donaldson, Education Minister Mr Weir said he acknowledged that the disposal of the former Lisnaskea High School site was “an extremely emotive issue for the organisation and the wider community”. Responding to Mr Weir and First Minister Arlene Foster in December 14, 2016, SEFF chairman Eric Brown criticised the move by John O’Dowd, and wrote: “The Protestant community of south Fermanagh feel absolutely betrayed throughout this process and cannot understand how this decision could not have been taken away politically." Mr Brown requested an urgent meeting with “you both as First Minister and Education Minister” as well as the Communities Minister, who at that time was the DUP’s Paul Givan. In March 2017 a letter to the bunscoil from an official acting for Minister Weir – who remained as Minister ahead of the snap Assembly election following Stormont’s collapse - said that the Education Authority would defer disposal of the site until December 31, 2017 “to allow time for the community organisation working with the Department for Communities (DfC) to complete the necessary business case and approvals process". DfC had agreed to act as the sponsorship body for SEFF whose interests were being represented by Castle Balfour Development Trust. In response to questions from The Detail regarding Bunscoil an Traonaigh a department spokesperson said: “In the absence of an Executive the Department of Education is continuing to progress policies and decisions taken by the previous Minister. “Before leaving office, the previous Minister was clear that the Lisnaskea High School site should be split to allocate a portion for use by Bunscoil an Traonaigh. “That remains the Department’s current position. However against a constrained capital budget position, funding is not currently available to progress the school’s relocation in the short term. “Department is aware of its statutory duty to encourage and facilitate the development of Irish-medium education and work is progressing to provide additional modular accommodation on the school’s current site for September 2018. This will enable the school to accommodate an increase in pupil numbers in the interim. The Department for Communities said it “agreed to sponsor South East Fermanagh Foundation’s proposal under Community Asset Transfer to explore securing part of the former Lisnaskea High School site for community use. The department has worked with SEFF in developing potential options for their proposal and to date has received no indication from SEFF that it has withdrawn its proposals". SEFF director Kenny Donaldson told The Detail that they were still involved in the process and "discussions are still ongoing from our perspective". Both Iontaobhas na Gaelscolaiochta (InaG) and Conradh na Gaeilge (CnaG) have claimed the school has met with “delay and prevarication” and accused the department of being in breach of its legal duty. Iontaobhas na Gaelscolaiochta chief executive Pilib ÓRuanaí – the trust fund for Irish medium education - said: “It’s the only Irish medium school in Fermanagh and there is every reason why it needs supported and no reason why children should be subjected to this sort of shabby treatment. The DUP declined to comment.